There are plenty of iconic numbers, or combinations of numbers, in the game of cricket. But surely the top of the list is occupied by 99.94, the one that needs no explanation to anyone with a passing knowledge of the game’s history. More generally Bradman’s batting gives cricket lovers plenty of other things to think about, and is a source of considerable interest to statisticians as well. For those who combine their passion for our great game with a mathematical bent, ’The Don’ is quite simply the gift that keeps on giving. By no means the first (and surely he won’t be the last) to try and deconstruct the legend Peter Kettle’s is not a name I expected to see on the cover of a book like this one. His one previous foray into cricket literature was an immensely worthwhile biography of the seldom remembered Leicestershire (and five times England) amateur batsman Eddie Dawson. A statistical analysis of Bradman is most certainly a change of genre. The point of the book is straightforward. Kettle sets out to examine whether Bradman really is as much of an outlier as his remarkable average indicates or, if the numbers are interpreted differently, he can be pulled back into the ranks of those ‘lesser mortals’ whose averages, magnificent as they are, still fall at least thirty points short of Bradman’s . For those of us without a thorough understanding of numbers it is difficult not to take the figures at face value, even though based on our experience in other fields of sporting endeavour the concept that one man can be so much better than everyone else who has ever played the game is, to say the least, counter-intuitive. Kettle begins his look at the question by selecting a pool of the best 165 batsmen across the history of the game. He exercises a bit of discretion here and one man who benefits from that is my childhood hero Barry Richards, and another a seldom remembered Pakistani wicketkeeper batsman from just after Richards’ time, Taslim Arif. In many ways Kettle raises familiar issues. He looks at the ‘dead runs’ in Bradman’s record, the comparatively weak attacks he faced at times, and contrasts that with others who had to score their runs against the strongest opposition. Also taken into account is the relative strength of the sides in which Bradman played. 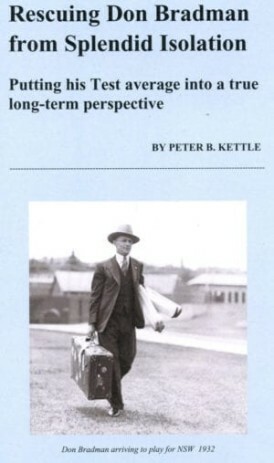 To this reviewer, no great statistician, the arguments presented are lucid and compelling, the more so because Kettle does thoroughly understand the game and explains his judgments in cricketing as well as statistical terms. That much conceded I will still be most interested to learn what our own master statistician and Bradman aficianado Dave ‘Chasingthedon’ Wilson makes of Kettle’s work. So, at the end of Kettle’s exposition what is the verdict? In a word, interesting, but I am not going to give the game away as far as the conclusion is concerned, if for no other reason than without an ability to put that in context by quoting at great length from Kettle’s text it would be impossible to do justice it anyway. Throwing out a few names and numbers would not be a sufficient explanation. It will therefore be necessary for those wanting to know the answer to buy the book. In that respect I do have a slight problem as I do not know too much about the the availability of Rescuing Don Bradman from Splendid Isolation, but as is often the case I know a man who does, and will therefore refer prospective purchasers to Roger Page or Ken Piesse, unless they reside in the northern hemisphere in which case I am told that, although not yet on his website, Christopher Saunders will be selling copies. The book is certainly recommended, and will appeal to all and, as a hint at what the conclusions may contain, particularly to those of us who are old enough and fortunate enough to have seen Barry Richards in his pomp.